This beautiful home on almost 150 acres offers so much to the buyer looking for privacy, wildlife at your front door and room to grow your own hay or livestock. Outbuildings surround this well built ,log home that exudes charm and a rustic feel that is perfect for this property. With a nice mix of pasture/hay and timber, opportunities for timber management and cattle ranching are here. Trails around the acreage make access to your new ranch easy. Springs, productive well, and the views make this complete! Exquisite Victorian style home! Built in 2006 this grand home offers all of the modern amenities & features you want but with the impressive Victorian style of yesteryear! Home sits on a spacious 1 acre lot between the Cougar Ridge & Harvest Vista neighborhoods. 1760 sq ft shop which is wired, insulated, and has a bathroom. Home boasts beautiful wood floors, granite, tile, dual heating & cooling systems, cental vac and a unique bedroom w/ a turret and large hidden bonus room. No detail was overlooked! Estate home in Canterbury on 1.75 acres. Quiet country setting with incredible sunset views. Updated with granite, tile, island, cabinets, rock fireplace, hardwood, carpet and roof. Large backyard playhouse with power and AC. West facing patio with surround sound and wired for hot tub. Finished three car garage with 220V. Park like setting with endless opportunities. Plenty of space to build a shop, pool and horses are allowed. . Minutes from downtown Eagle and close to schools. This Queen Ann Victorian home was originally designed & built in 1894 for Edmund & Sofia Fowler. Located at 5th & Myrtle in the Central Addition Neighborhood, it was move in 2015 to it's new location. While it retained its historic integrity for over 100 years, it has all the features of a new home. All original woodwork, doors, flooring, with beautiful stained glass throughout, spectacular kitchen & new bathrooms. Large basement with 9 ft. ceilings create a bright & sunny basement. This home is stunning! Peace and serenity nestled at the base of the mountains in the charming town of Sweet, Idaho. Bring your horses and your cattle to this fully functional 104+ acre ranch. Gourmet kitchen features, granite, hardwood floor and 2 ovens. Master suite features Jacuzzi tub, walk-in closet, dual-vanity and bidet. Mud room with shower, utility sink, extra storage and central vac. Basement has large living space, sun room, and storage room. 2 hay barns, 30x60 shop, butcher shop, tack room, riding arena, hay fields. Once in a lifetime opportunity! A one-owner, 1970’s Farmhouse design, set on an incredible ~.85 acres, in the coveted agricultural corridor of the North End. 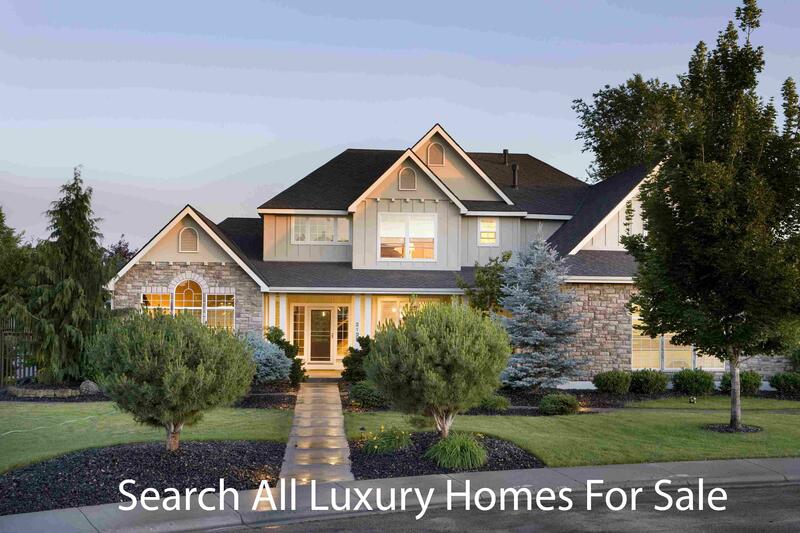 Offering development potential, multi-use options, or the opportunity to build or remodel on an estate-size property, in Boise's most sought-after neighborhood! The abundance of space provides room to roam, while being conveniently located within blocks of the North End’s prime attractions including foothill trails, Elm Grove, Hyde Park & Camel's Back. Casual elegance permeates throughout this finely crafted custom home situated on a quiet half acre golf course lot. Only minuets to Lake Lowell and fast access to the Boise Airport - this home has it all. Perfectly maintained w refinished hardwood flrs & a remodeled mstr bath shower to name just a few. Gourmet kitchen with 48” pro quality range, built in wine & kitchen refrigerator. All secondary bdrs feature an en suite and walk in closets. Dual HVAC systems, 2x6 exterior walls, see complete amenity list. Come and see this beautiful dream home on nearly two acres! Gorgeous Owyhee Mountain views! Bring your horses! Full horse setup with three stalls, wash rack and tack room. Kitchen features granite counters, knotty alder cabinets, and butler's pantry with wine chiller. Master features sitting room and walk in tiled shower. Large upstairs bonus room with bathroom. 40 X 48 insulated shop with RV Bay. Vinyl fencing and pressurized irrigation. Don't miss this extraordinary property! New Construction in NW Boise! Phenomenal floor plan that offers an expansive great room opening to the dining room and impressive kitchen w/stainless steel Bosch appliances, built in fridge ($9K value), and custom cabinets. Hardwood floors in great room & all high traffic areas. The rear covered porch extends across the main living areas providing continuity to the outdoor living space. This home also includes an oversized walk-in pantry, convenient laundry room and an office. A true Idaho rancher gem w/ stunning views of the Snake River on 5 acres. 4100 sq ft single story with a 6 car, RV bay, attached garage. Stucco, stone and log exterior accents welcome you home. High ceilings with exposed log rafters, upgraded window package, 3 bedroom 3 bathroom with den, great room, large laundry rm, 2 fireplaces, designer kitchen and master bathroom, pool table rm, bar area, formal dining, walk-in shower, soaker tub, kitchen island w/ sink, gas cooktop, vaulted ceilings & VIEWS for days!